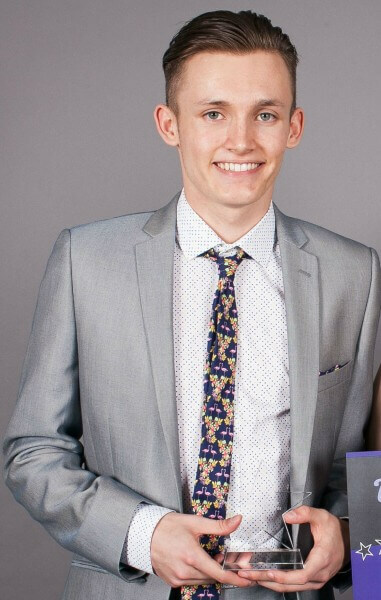 Barnsley College student Bradley Carr has been awarded a ‘Highly Commended’ recognition at the Association of Colleges (AoC) Student of the Year awards. The AoC Student of the Year award is a national award which celebrates the achievements and successes of exceptional students who stand out from the crowd. Bradley was nominated for his commitment to his studies whilst suffering a brain tumour and undergoing subsequent treatment. Bradley, 17, completed his studies at Barnsley Sixth Form College last year and has progressed to Barnsley College to study Media in order to advance his career in marketing and advertising. Throughout Bradley’s illness, he continued to attend college, even after gruelling chemotherapy treatment, only missing lessons when he was attending hospital. In his spare time he has volunteered at Dearne Valley Lifesaving Club teaching lifesaving skills to children, even when he was unable to join the students in the water during times of lowered immunity he maintained support poolside. In total the AoC received 82 nominations from colleges all over the country, each of which highlighted the exceptional work of students. The judging panel was overwhelmed by the variety of applications and the extent of the success of the students, whether in college work or extra-curricular activities. The judges were impressed with Bradley’s commitment to his studies through his illness and his wider voluntary work with the Dearne Valley Lifesaving Club and felt that this needed to be recognised.